Club Penguin Cheats by Mimo777 Club Penguin Cheats by Mimo777: Club Penguin News... Card-Jistu Snow in January? Club Penguin Time Issue #317 is here! And, Card-Jitsu Party Construction is on! 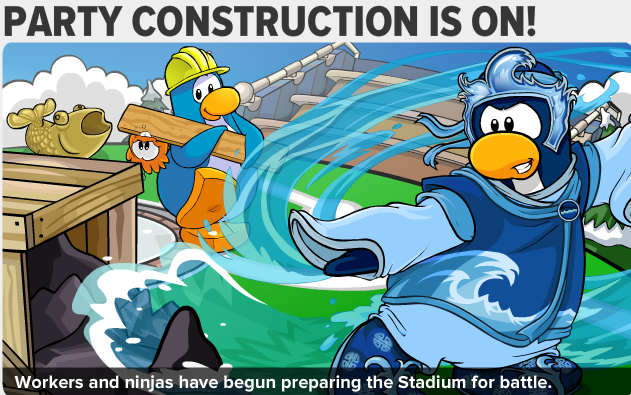 The Stadium is being transformed into al huge Card-Jitsu Arena! The Party begins November 24th! News Flash! 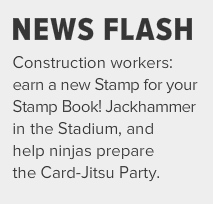 Go get your Construction Stamp at the Stadium now! Saweet! Club Penguin is bringing a new play to the Stage in honor of the Card-Jitsu Party! "Battle of the Ancient Shadows..."
Cool new costumes and effects at the Stage November 24th, too! Sensei says the Wilderness is vast and one day may reveal the element of Snow. 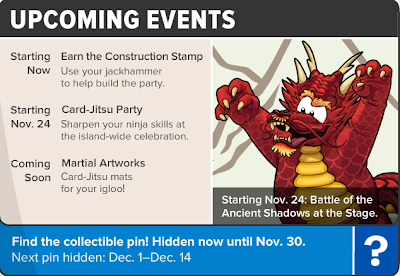 Could this be a hint that the Card-Jitsu Snow could be revealed at the Wilderness Party? If so, that would mean JANUARY for Card-Jitsu Snow! Woot, woot! Look at the Sensei pictue!! There is the volcano and a waterfall. And if you look closely you can see a Snow cloud on top of a hill and it's snowing there. It could be a clue. whatever martinj100 said could be true... Just get a jet pack and go there! Or just go into a time machine that Gary could make! roflol! Hi i've been seeing some penguins wearing a colorful kimono. It is dark and sparkly on the outside and has fire prints on the inside. May i know where can i get it? Greetings most people, The following web site can be good and for that reason is just how the situation was first broadened. I love examples of the opinions at the same time despite the fact that I will desire all of us maintain the item about question when you want add value to the object.